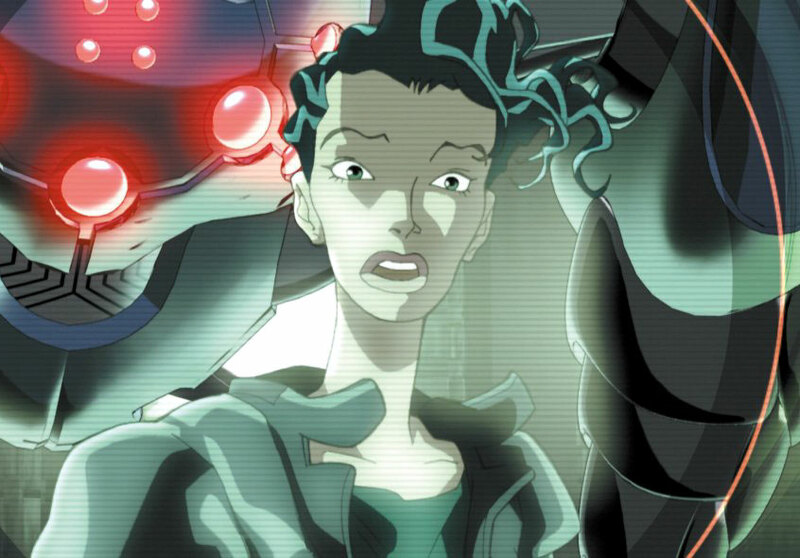 Although I admire the enthusiasm behind The Animatrix (2003), I’m not sure it adds very much to the mythology established in the first movie (I refuse to acknowledge the existence of the sequels… aside from Monica Bellucci’s contributions, of course)… and, in some ways it actually detracts. For instance, it’s suggested that it was the humans who chose to black out the skies, when they discovered that their robotic enemies were solar powered… but aren’t humans “solar powered” too? I don’t know a lot about human biology, but I do know that most of the food we eat requires sunlight to grow… so that seems like a pretty glaring plot hole to me. Tch! Anyway, my main reason for making the purchase in the first place was Peter Chung’s Matriculated. Although it may have lack the kinkier deviations of Aeon Flux, it’s still a typically mind-bending tale of humans trying to construct their own “matrix” in order to recruit robots to their cause. Once you get into the faketrix, it’s pure psychedelia, as they give their hostage a trip it’ll never forget! While the esoteric content is classic Chung, the visuals are light-years ahead of his old MTV series, and it sets a person pondering what he could come up with now if anyone were ever crazy/inspired enough to sponsor a proper, animated Aeon Flux feature. Ironically, in the making of featurette Chung claims that he was only added to the roster after another animator dropped out. Being a last-minute replacement allowed him more latitude, as the Wachowski Brothers were happy enough with what they’d achieved already to let him do pretty much whatever he wanted. That, I have to say, is a very happy accident. This entry was posted in Rants about Art, Rants about Films and tagged Aeon Flux, Monica Bellucci, Peter Chung, The Animatrix, The Matrix. Bookmark the permalink.